Pictured are children in Uganda offering thanks to Norwalk High for its donation through the non-profit Drop in the Bucket. Norwalk High School seniors raised $13,000 this school year for thirteen charity organizations including Drop in the Bucket. The nonprofit provides fresh water and sanitation systems for schools in Africa. For past the six years Dean Gray, an American government teacher at Norwalk High School, has organized a student-led program known as Giving Charity to Charities. The program calls for 12th-grade students in social studies classes to select a local, national or international charity organization to receive the proceeds from campus fundraising drives held by the students. The selections are based on the personal interests or connections the students have to issues or causes. Since 2013, the program has raised a total of $75,000 that have gone to 54 different charities. In addition to an annual winter student assembly on campus where the classes present their donations of $1,000 to charity group representatives, there are usually also acknowledgement letters or phone calls received by the school from each of the charity groups. 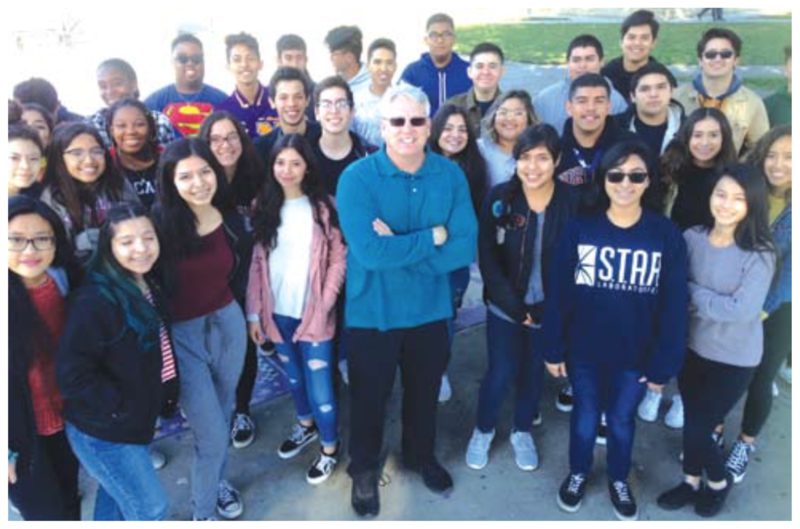 FUNDRAISERS: Teacher Dean Gray on the campus quad at Norwalk High School with one of his Advanced Placement American Government classes that participated in the school’s Giving Charity to Charities program this year. The program has existed for six years. But this year, there was a special sort of thank you that was offered by Drop in the Bucket, which received a $1,000 donation from the students. Gray was happy but not entirely surprised to see the kind messages. “It’s another success story of our kids making a difference in people’s lives. Fresh water. How awesome is that?” he said. Bailey Martinez, 18, is the student who did the research to find a water-related charity to propose to classmates as a donation recipient. He found out that unlike some groups that just passed along funds to other organizations that perform the work, Drop in the Bucket was different. The nonprofit was directly involved with staff on-ground in the countries doing the labor to plan and develop the systems. to fellow students and then also sold them off campus. All of the teams did fundraising in the same way for the same amount of time. A total of $13,000 was raised for 13 charities. An additional charity, Race to Erase Multiple Sclerosis, received $1,000 donated from a local golf tournament organized by teachers and staff. Nineteen students representing the teams, along with teachers involved in the program, were recognized at the Feb. 26 meeting of the Norwalk-La Mirada Unified School District Board of Education.